Yesterday, Herr Kotz’s German class made their annual appearance on Kennett Middle School “Live on Five” Morning Announcements. Every year the eighth grade German class sings Christmas carols live for the entire school. This was the first year we were able to capture their performance; please enjoy the below video. Congratulations to the 6th grade chorus. You had a great performance last night. 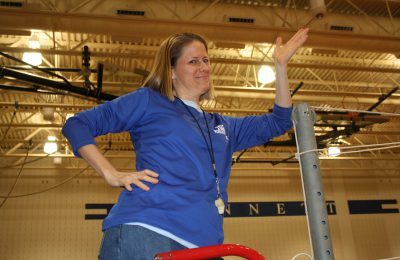 This year’s musical is not always “Rosie” especially when Mrs. Peterson comes on the scene. It’s all about “Kids” and their obsessions for “Conrad Birdie, the character who was inspired by the story of Elvis Presley being drafted into the Army in 1957. Most of you have already guessed AND are correct! 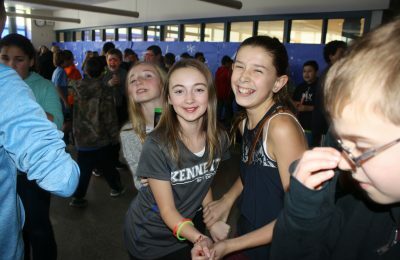 This year’s KMS Musical is Bye, Bye Birdie. Over break, you would be wise to watch the 1995 version with Vanessa Williams and Jason Alexander. Study it! Know it! Sing it! Students interested in performing on stage MUST attend one of the 2 meetings on Thursday, January 5th and Friday, January 6th. At these meetings, actors will learn what to prepare for auditions. The 2 meetings will be the same, and you may come to both to be better prepared for your audition. Students who are planning to audition to perform on stage must stay from 2:35-4:30. Students interested in joining the Stage Crew MUST attend ONE of the meetings on Thursday, January 5th OR Friday, January 6th. 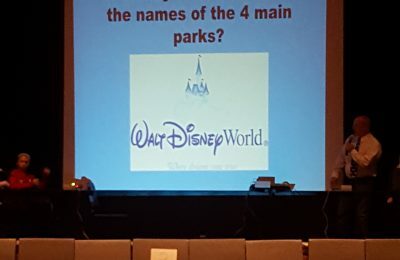 At these meetings, Stage Crew will learn about the back stage roles and will petition for their preferred positions. Students that are interested in joining Stage Crew must stay from 2:35-3:45. “KIDS”, If you have any questions about the musical, the upcoming meetings, or auditions, please see or email Mrs. Uster or Mrs. Coe. We are still collecting toys to donate to families less fortunate. Please bring your donations into the main office. Attention all students working on the children’s book project. recently PLEASE stop by the art room before the holiday break and show her your work! Please stay tuned for a video on the history of Christmas. Please remain tuned in until the end of the video because when we return we will have the annual christmas caroling form Heir Kotz’s german class. Congratulations to the 7th and 8th grade chorus concerts who performed a beautiful concert last night. Good luck to the 6th grade chorus performing tonight. This year’s musical was inspired by the story of a very famous singer who was drafted into the Army in 1957, is set in The Big Apple and Sweet Apple, and was nominated for 8 Tony Awards and won 4, which was quite an accomplishment for its inexperienced production team. If you have any questions about the musical, the upcoming meetings, or auditions, please see or email Mrs. Uster or Mrs. Coe. Please stay tuned for which State is it Wednesday. 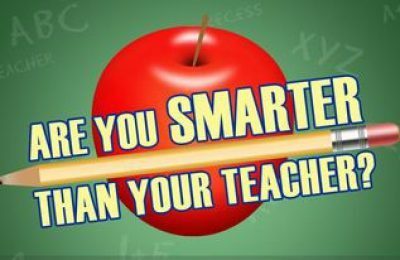 We hope the 7th grade students have a delightful day on their field trip today. Today we have our rehearsals in the small gym.. Mrs. Mancuso’s 2nd period classes will be meeting during periods 1-2. Please go to homeroom first, then come down after announcements. 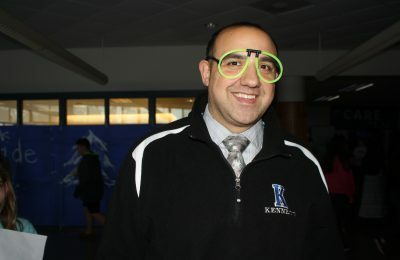 Period 3 classes will be meeting during periods 4-5 today. 7th Grade Chorus members should report to the cafeteria at 615. 8th grade Chorus members should report to the small gym at 615. Treble Choir members should report directly to the stage at 6 pm. This year’s musical, set in The Big Apple and Sweet Apple, was nominated for 8 Tony Awards and won 4, which was quite an accomplishment for its inexperienced production team. 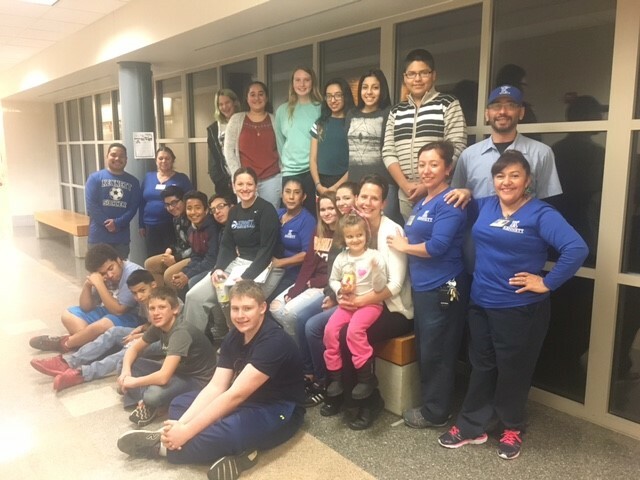 Check out this awesome picture that is the definition of Kennett PRIDE… Mrs. Kate Madigan and her LEAD group stayed after school and made dinner in the Family and Consumer Science kitchen for our maintenance staff. Awesome job, team Madigan! In the spirit of the season, students in Kennett Middle School’s ESL program were recently reading a Christmas Carol and analyzing the character of Scrooge. The class had many discussions about the importance of giving back to others and, as a result, they decided to do a community service project. 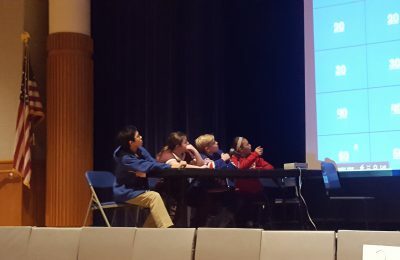 Before this project, they had many conversations about how the New Garden Police Department provides resources for them as individuals and for the school as a whole. 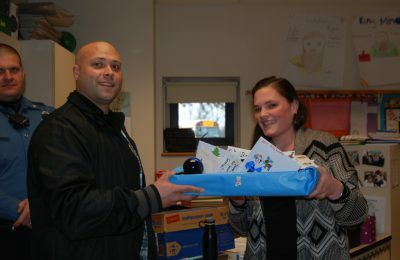 Together, the students decided that the township police were the perfect candidate for the community service project. 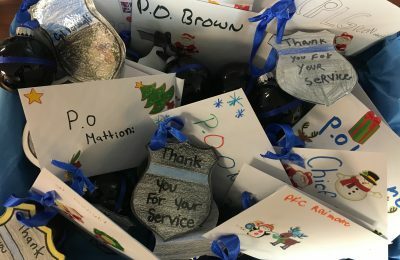 After receiving an officer’s name, each student decorated a Christmas ornament and Christmas card to give to that officer. 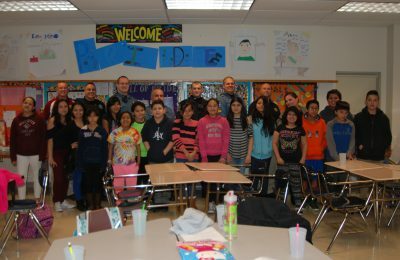 The best part of the project was definitely the officers coming to visit the students. 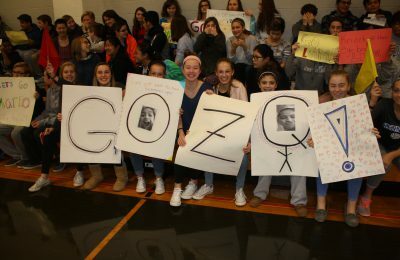 The students were so excited and it made a big impact to see how appreciative the officers were. What an exciting year we are having! We just wrapped up our fundraising for this year’s Adopt a Family events. 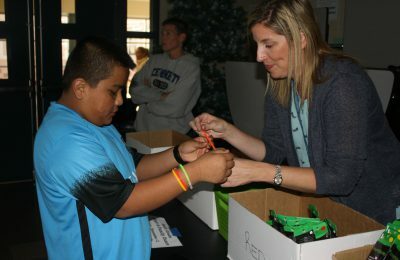 Each grade decides on a fun way for teachers, students, and the PTO to raise money for families in need. We are so excited to have raised around $3,700, enough money this year to support 22 families! WOW! 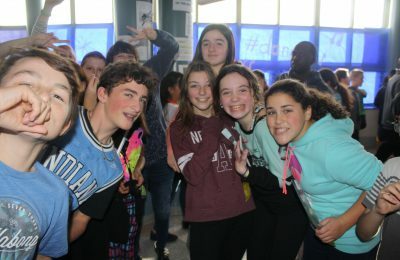 The sixth grade had a dance during 8th and 9th periods in the cafeteria. The students and teachers sang and danced the afternoon away. 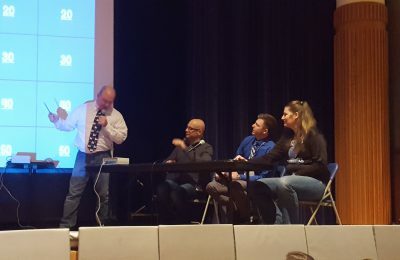 Here are a few pictures of the fun. 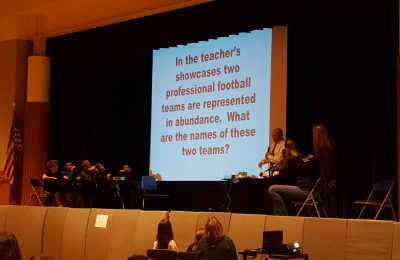 The seventh grade students took on the teachers in a game show called, “Are You Smarter Then Your 7th Grade Teacher?” Students and teachers took turns answering pop culture and other fun questions. 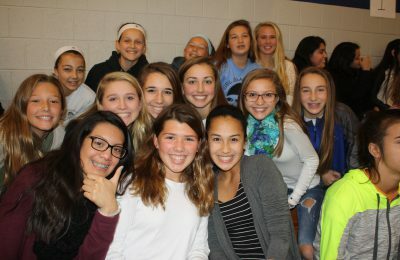 The eighth grade students met the teachers on the volleyball court! We had a fun afternoon of listening to music and watching great games. 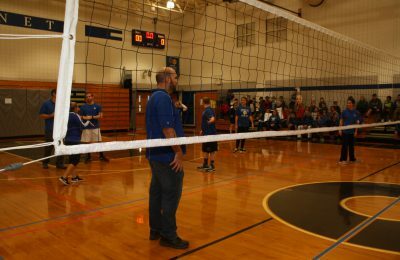 Students put in money for chances to play the teachers and then the girls volleyball team finished out the day with their wicked serve. We had a blast! Here are a few pictures so you can see the fun for yourself. 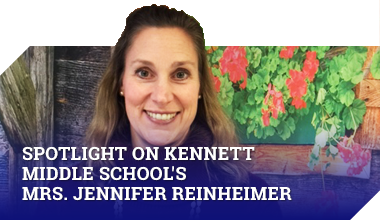 Way to go Kennett Middle School! Our students and staff are committed to making a difference. This is a very exciting time of year. Please remember that you can wear festive attire next Thursday, December 22nd, the day before break. Bring out your best holiday sweater or your santa hat. We will enjoy holiday music in the cafeteria that day as well. Mrs. Mancuso’s Period 4 classes will meet during periods 2-3. Mrs. Mancuso’s Period 5 classes will meet during periods 4-5. All of Miss Mule’s classes will meet during periods 8-9. Mrs. Roten WIN language Arts class please report to the Library today. Thanks! This year’s musical was nominated for 8 Tony Awards and won 4, which was quite an accomplishment for its inexperienced production team. Students interested in performing on stage MUST attend one of the 2 meetings on Thursday, January 5th and Friday, January 6th. At these meetings, actors will learn what to prepare for auditions. The 2 meetings will be the same, and you may come to both to be better prepared for your audition. Students who are planning to audition to perform on stage must stay from 2:35-4:30. If you have any questions about the musical, the upcoming meetings, or auditions, please see Mrs. Uster or Mrs. Coe. Congratulations to Mrs. McLaughlin’s Period 5/6 Language Arts class for winning 1st place in last week’s Accelerated Reader. Attention all Day 2 Band Lesson Students: Students with Band Lessons today 1st through 4th period will be rescheduled for later next week, Mr. Whisler will not be in the building this morning. Day 2 Band Students with a lesson Period 7 through 9 still need to attend their lesson today, Mr. Whisler will be back in the afternoon. Attention all students working on the children’s book project. Mrs. Uhl needs an early Christmas present, if you have not shown her any work recently PLEASE stop by the art room before the holiday break and show her your work!